I was at an ice-fishing Open House at a retail tackle shop recently. There were some anglers there who had been looking at a long range weather forecast. According to this forecast, cold weather is headed to the upper Midwest, and these anglers were guessing that they would be on the ice in north Iowa by the end of November, maybe even earlier. With that optimism in mind, now is a good time to start thinking about that first early ice fishing trip. For many of us, that first time on the ice will be in pursuit of panfish, probably on ponds and small lakes at first, as they are typically the first to get a cover of ice. 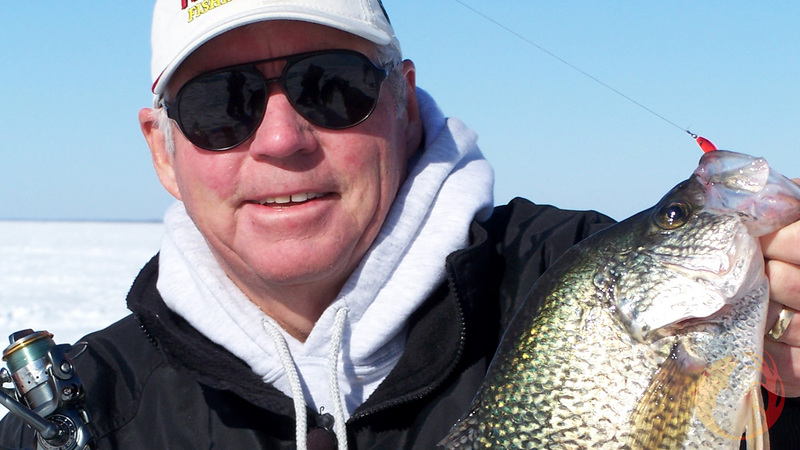 Here are some ideas for catching panfish through early ice. Here’s a photo from a while back: Duane Peterson with a big crappie that he took on a small jig. First thing: Make really sure the ice is safe. You don’t need to be the first one out there. If there are other people on the ice, and if they’re bigger than you, the ice should be safe for you. However, it’s not a bad idea to wear a life-jacket on early ice. I’ve got a Cabela’s Inflatable Vest that works well: You don’t even know you’re wearing it. Pop plenty of test holes as you walk to your fishing area. Tiny baits that hang horizontally in the water are favored by many accomplished ice-anglers. Bro’s Bloodworm and Slug Bug are good examples of baits that ride horizontally in the water and really fool fish. When the ice is safe but not before, keep these ideas in mind and you’ll catch more panfish through early ice.